Wondering what gifts to give your loved ones? How about a piece of jewellery, that is beautiful & meaningful. It’s the time for Festivity, so lets rejoice and celebrate together with NAFISA DESIGNS. Look elegant in abstract and conceptual Jewellery on Eid Al Adha, available in our Casual Charisma collection. 18kt Gold jewellery in Natural Gemstones for Onam. In our Birthstone Collection you can combine the birthstones of your loved ones for the festival of sibling love, Raksha Bandhan. You can even buy in advance for your anniversaries and birthdays and other upcoming occasions. Don’t Miss out and grab this offer which is valid throughout the month of August on our website. 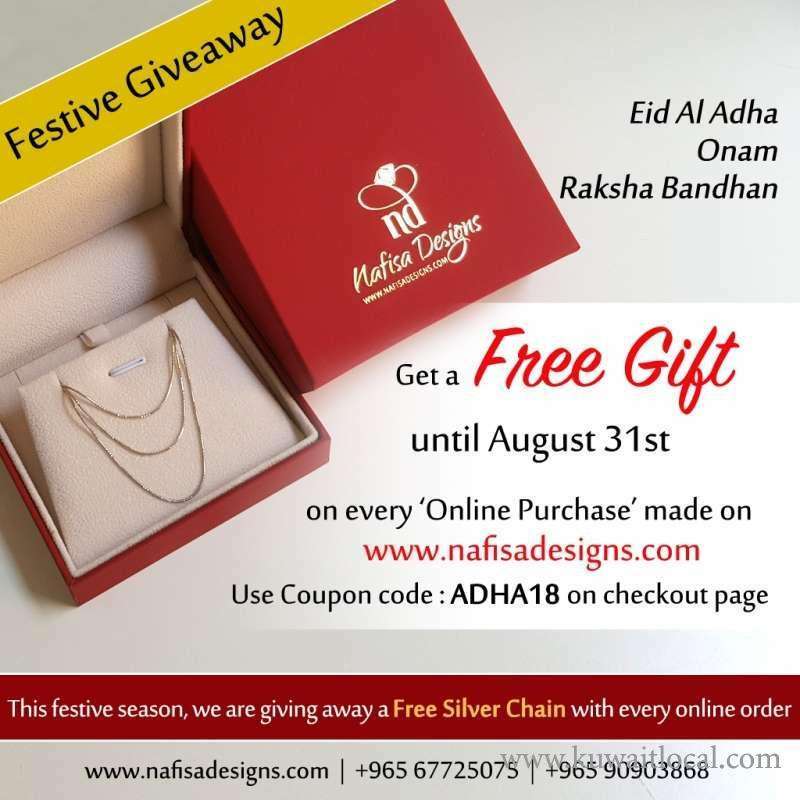 You just have to make an online purchase on www.nafisadesigns.com and add code ADHA18 on checkout page and you will receive a free silver chain with your order. This Offer is available on all items on our website in all our collections. Visit www.nafisadesigns.com for online orders or call +965 67725075 | +965 90903868 if you need any assistance.